As the Steelers sputtered to an uninspiring 16-13 win over the lame duck Cincinnati Bengals, the post-game analysis seemed to write itself. The headline “Steelers Sloppy Win over Bengals Proves Pittsburgh Doesn’t Deserve Playoffs” appeared ready to spontaneously spring to life. On offense the Steelers lacked big game focus and, at times, it even appeared that the Bengals defense wanted it more. And perhaps some truth remains in those words. But as fate would have it, an internet access outage on 31st prevented me from writing, or following much of the post game chatter. And that turned out to be a blessing in disguise, once again reinforcing the lesson that sometimes a bloggers best friend is an inability to provide instant reactions. As it turns out there was more than meets the eye. 24 hours after kickoff, Ed Bouchette and Gerry Dulac of the Pittsburgh Post-Gazette confirmed something that Jim Wexell (and probably others) appeared to be hinting at: Discipline, not injury was what kept Antonio Brown from playing against the Bengals. While exact details vary, Antonio Brown got into a heated argument with one of his teammates on Wednesday, some say it was Ben Roethlisberger although Roethlisberger is denying this, threw a football at a player, and sat out practice for the rest of the week. Mike Tomlin promptly benched Antonio Brown. The Steelers offense struggled in his absence. JuJu Smith-Schuster, fresh off winning the team MVP award, didn’t appear to be ready to carry the load as the team’s number one wide receiver. James Washington made another, nice 55 yard catch but made little other noise. Vance McDonald and Jaylen Samuels had a few nice grabs, but nothing game-changing. James Conner ran well, but never really seemed to get into a groove. Not surprisingly, the Steelers struggled on 3rd down, making it harder to commit to the ground attack as the game wore on. The Steelers offense appeared to be out of sorts for most of the game. Maurkice Pouncey, the undisputed leader of the offensive line, give up two penalties on one drive. The line itself appeared to be off its game as Ben Roethlisberger’s lone sack masks the 7 hits he took. One player admitted that the situation impacted his desire to play the game. 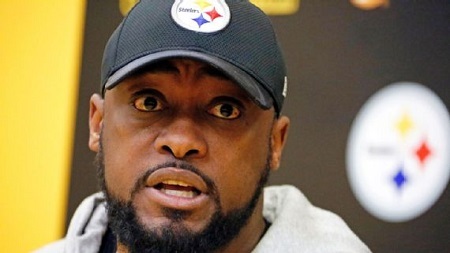 Mike Tomlin’s critics will no doubt pounce on that as further ammunition that he’s lost control. I’m not ready to go there. 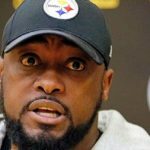 Antonio Brown’s antics appeared to be a distraction early in the season, yet Tomlin appears to have kept them in check for most of the year. Critical fans should remember that even disciplinarian coaches such as Bill Parcells have struggled with diva wide receivers. While I’m not ready to completely excuse Mike Tomlin and his staff for the offense’s lackluster performance, the Brown Blow Up explains a lot. Right now Steelers Nation appears to be divided into two camps. One that thinks Mike Tomlin (and the rest of his staff) must go, and another than thinks that at the very least Keith Butler must get the ax. While the Steelers defense has issues, I’m not convinced that Keith Butler is the root of their problems. Against a second string Cincinnati Bengals offense and fighting against the drag of an offense that punted 5 times including three 3 and outs, Keith Butler’s defense limited the Bengals offense to two field goals. That’s about what you can expect under these circumstances. No, the Steelers defense wasn’t perfect as it gave up a 51 yard run to Joe Mixon which let the Bengals right back into the game. But the Steelers defense held in the Red Zone, and held on again after the Steelers took the lead. Along the way, T.J. Watt had yet another strip sack and another forced fumble. Cam Heyward had 2 sacks, while Stephon Tuitt and Anthony Chickillo split another sack. Morgan Burnett and Tuitt came up with pass deflections at critical moments in the game, while Coty Sensabaugh added two more deflections to his total. 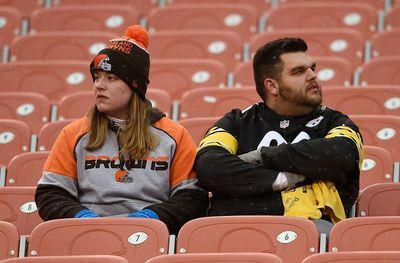 The Steelers closed out 2018 with the win that they needed, but the Cleveland Browns couldn’t quite deliver the help necessary to push Pittsburgh into the playoffs. So be it. You are your record, and at 9-6-1 the 2018 Steelers are a portrait of a slightly above average NFL team. What exactly that means going forward is a question I will address in the coming days, but for now I’ll simply say that a close win over Cincinnati combined with a close loss by Cleveland to Baltimore provides a fitting end to a frustrating season. In a stunning development 2 days before their 2018 season finale, the Pittsburgh Steelers placed place kicker Chris Boswell on the injured reserve list and signed Matt McCrane has his replacement. Chris Boswell has had a rough campaign in 2018. During the Steelers home opening loss to the Kansas City Chiefs, Chris Boswell missed two extra points and a field goal in a game ultimately decided by 5 points. Against the Oakland Raiders, Chris Boswell missed two field goals in a game ultimately decided by six points. Early on the Steelers stuck by Boswell, but after the Oakland loss, Mike Tomlin opted to hold tryouts for replacement kickers. Chris Boswell won the try out, and although he missed a 32 yard field goal in the middle of the 3rd quarter, Mike Tomlin unhesitatingly sent him out to kick a 48 yard insurance field goal late in the fourth quarter of the Steelers win over the Patriots. Against the Saints, Boswell kicked field goals of 49 and 30 yards and made both extra point attempts. Steelers place kicker Chris Boswell on Injured Reserve, sign tryout kicker Matt McCrane. Talked to Boswell on Thursday and he thought he had turned the corner after three straight make, but turns out he was dealing with something. However, over on 247Sports.com, Jim Wexell is reporting that Chris Boswell entered the game against the Saints with a groin injury. That is certainly possible, but his name has not appeared on the injury report this week or the week before. Sean Davis returned to practice for the Steelers reducing the likelihood that Jordan Dangerfield or Morgan Burnett will play in his place. Antonio Brown also missed practice, leaving his status in doubt. If Antonio Brown misses the game James Washington will likely start alongside JuJu Smith-Schuster. While losing Brown would be a blow, Eli Rogers‘ return and Vance McDonald‘s presence should give Ben Roethlisberger plenty of targets. Vince Williams also missed practice, and meaning that L.J. Fort will likely start along side Jon Bostic. 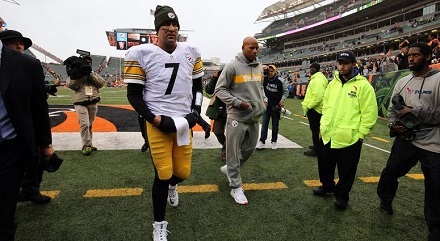 Steelers Report Card for Win Over Bengals – Legacy Defining Anyone? Taken from the grade book of a teacher who wonders if he really has seen a “legacy”defining performance from his pupils, here is the Pittsburgh Steelers Report Card for the win over the Bengals at Paul Brown Stadium. Chris Boswell quietly made all of his kicks which was a welcome change especially in the confines of an opposing stadium during the rain. Jordan Berry boomed off two long punts and landed 3 inside the 2. Ryan Switzer had a long punt return of 15 yards and some decent kickoff returns. Randy Fichtner’s offense appears to be finding its rhythm. When the passing game isn’t quite working, the running game is able to pick up the slack. Such balance is necessary for sustainable success in the NFL. Keith Butler’s defense continues to improve. After a big win last week and going into a big game against the Bengals with Ryan Shazier’s recovery as a backstory, it would have been easy for the Steelers to get caught up in the emotional roller coaster. Instead, they did just the opposite. The Bengals 51 yard 2nd half kickoff return could have easily spelled doom. Yet the Steelers defense went out and forced a punt despite giving up a penalty that gave Cincinnati a 3rd an 1. At the end of the game the Pittsburgh’s poise was present for all to see. There was no panic in the Steelers huddle or on the sidelines as the Bengals went up by one with just over a minute to play. Nor was there any sense of desperation evident when the Steelers found themselves in 2 third down situation on that final drive. Instead, Ben Roethlisberger and Antonio Brown waited for their moment, and then drove a stake through the Bengals secondary. Everyone will long remember Antonio Brown’s last minute touchdown, as well they should. Meanwhile JuJu Smith-Schuster spent the afternoon making critical, if less highlight-worthy catches. But he is in this space for two heads up plays. The first came when he out fought a defensive back for a catch at the goal line, and the second came when he recovered Vance McDonald’s fumble. 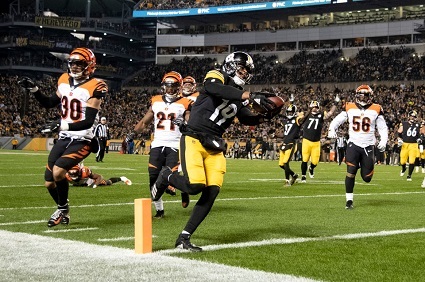 A turnover in either occasion would have lost the game for the Steelers, but neither were and for that JuJu Smith-Schuster wins the Unsung Hero Award for the Steelers 2018 win over the Bengals at Paul Brown Stadium. Ike Taylor’s career ended here. Chris Boswell once kicked six field goals AND needed to make a shoe-sting tackle for the Steelers to earn a narrow 4 point win. Ryan Shazier’s forced fumble set up the Steelers first post Super Bowl XLV playoff win. And of course, two years later Ryan Shazier suffered a life-changing injury on this very field. The Steelers went on the road against the AFC North, division leading Cincinnati Bengals still searching for their first conference victory. The contest lived up to the series’ pedigree featuring intense action, late lead changes, and a Steelers victory at the final gun. But more importantly, if Mike Tomlin can keep his team focused, the impact of this latest Paul Brown Stadium milestone could be felt well beyond the October afternoon in which the Steelers authored it. Old school football commentators love to remind us that games are won and lost at the line of scrimmage. And very often that is true. Whether you’re playing offense or defense, control the line of scrimmage, and you control what the ball carrier can and cannot do. In the first half the Steelers won the scrimmage battle. Pittsburgh didn’t dominate Cincinnati the way they dominated at Atlanta, but they kept the Bengals paws off of Ben Roethlisberger, and they opened holes for James Conner to explode through. While Joe Mixon did gouge the Steelers defense for a few long runs, Pittsburgh stuffed him on a number of occasions. Winning in the trenches was critical for the Steelers, because Ben Roethlisberger wasn’t at his best in the first half. Despite having ample time to throw, Ben Roethlisberger and Antonio Brown still struggled to connect, with the quarterback having his best success hitting Vance McDonald and Jesse James up the middle. And when he did try to find his wide receivers, Big Ben tempted fate, as JuJu Smith-Schuster was forced to go into defensive back mode to prevent an interception at the goal line. But thanks to the Steelers force up front, James Conner was barreling through the line for his second touchdown one play later. With 1:07 left to play, Pittsburgh seemed poised to take a 14 point lead into the locker room. But winning at scrimmage means little if you leave the rear door unlocked. That’s exactly what Danny Smith’s special teams did. Alex Erickson not only ripped off a 47 yard return, but an Artie Burns penalty added another 5 yards to the end of it. Suddenly, instead of needing to go 80 yards for a score, the Bengals only had to go 44. And 44 yards Andy Dalton and crew went, tying up the game at the half. The ability of the Steelers offense to compensate for the adjustments made by Marv Lewis and his defensive staff is the story of the second half. Twice the Steelers offense reached the one, and twice Bengals defense forced Pittsburgh to settle for field goals. But how the Steelers got into the Red Zone was as equally important as the Bengals ability to prevent Pittsburgh from banging it in when they got there. The Steelers 2nd field goal of the 2nd half had been set up by a 48 yard pass from Ben Roethlisberger to Antonio Brown. A bit of old time Ben-to-Brown magic that foreshadowed things to come. The Steelers defense has been under fire for much of the season, and a Cincinnati offense that featured Tyler Boyd and A.J. Green figured to offer another stiff test. While Pittsburgh was far from perfect, the Steelers defense did its job. The Steelers defense broke even with the Bengals offense going 6 for 12 on third downs. And although the defense gave up the final touchdown a little too easily, that set the stage for what was to come. 4th quarter comebacks are what make football great. Few things are more satisfying – or aggravating – than watching an offense methodically move down the field for the decisive go ahead score. The team that scores enjoys unrestrained glory. The team that fails to hang on fights utter demoralization. Yet, for whatever Ben Roethlisberger’s flaws as a quarterback he might be, he has never succumb to demoralization in those moments. Ben Roethlisberger hit JuJu Smith-Schuster a few times, tried to hit James Conner and Justin Hunter. With an Usain Bolt like bust of speed, Antonio Brown knifed through the middle of the Bengals defense for the go ahead touchdown. Another Paul Brown Stadium Milestone for Pittsburgh? Each represented a critical turning point for the Steelers. In some cases those turning points transcended in which they occurred. 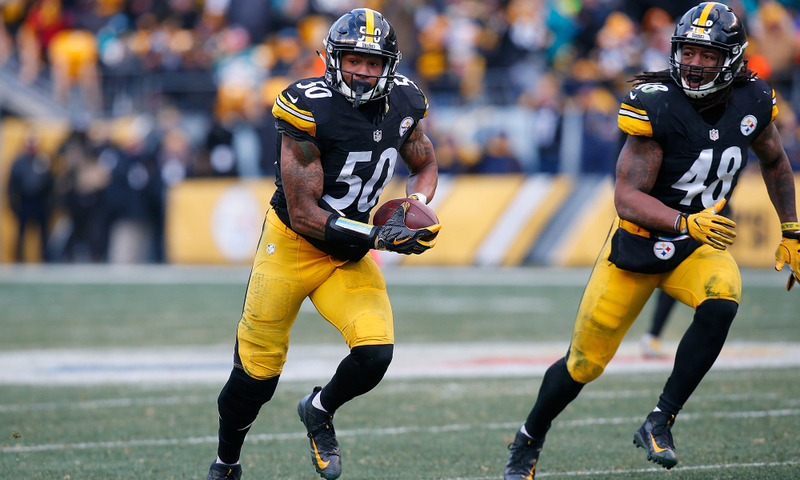 Ryan Shazier’s forced fumble in the playoffs legitimized the Steelers as a Super Bowl contender. Less than a month ago, commentators argued with good cause that Shazier’s spinal contusion had closed that same Super Bowl window. While no one is talking Super Bowl in Pittsburgh this morning, this latest win at Paul Brown Stadium certainly makes the Steelers look like legitimate AFC North contenders, and that’s not a conversation any serious person would have considered started even two weeks ago. Turning points in sports can be curious things. Sometimes you can see them coming. Other times they surprise yet are obvious immediately after the fact. And yet, on some occasions, a turning point can occur yet not be obvious until a long time after. Monday December 4th, 2017 marked a clear turning point for the Pittsburgh Steelers defense. Everyone immediately knew that Ryan Shazier’s spinal contusion represented a clear season-changer for the 2017 Pittsburgh Steelers. Shazier’s injury impacted the rest of the 2017 season, and arguably every decision the Steelers made during the 2018 off season. Yet the loss of Ryan Shazier may not have been the only turning point for the Steelers defense that evening. 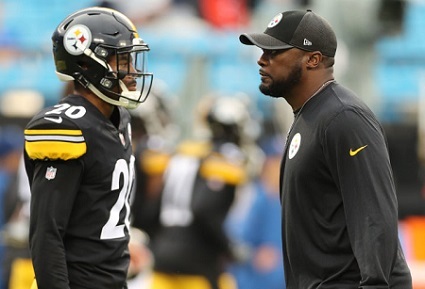 Cam Sutton made his NFL debut that night, and the only turning point that the rookie cornerback’s debut seemed to mark was the one where the Steelers coaches officially reached the point of desperation. Pittsburgh had lost Joe Haden halfway through the Colts game, since losing Haden the Steelers had given up a 57 yard touchdown pass in every 27 and a half minutes of play. And here were Mike Tomlin, Keith Butler and Carnell Lake, activating to a rookie 3rd round draft pick from IR who’d had all of 6 quarters of preseason experience. Yeah, the Steelers certainly seemed desperate. Things are very different going into the second game of the 2018 season. Joe Haden injured his hamstring in the Steelers 21-21 tie with the Browns and is likely to miss the game against the Kansas City Chiefs. Yet no one is panicking. Cornerback has been pegged as one of Pittsburgh’s weaknesses since Super Bowl XLV. Kevin Colbert and Mike Tomlin have tried to address the weakness with a mix of high-profile players (i.e. Cortez Allen) and MoneyBall type signings (bringing William Gay back in 2013, signing Brice McCain) with mixed success. 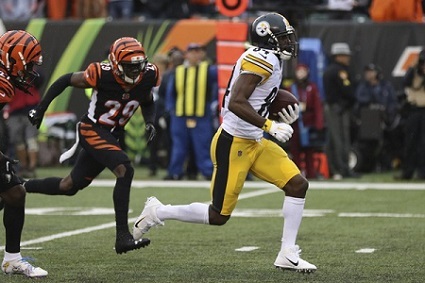 Cam Sutton still must prove himself in his first start, and Artie Burns needs to translate the flash he showed at St. Vincents to Heinz Field, while Mike Hilton can be counted on to continue to deliver. But if they can accomplish that, then Cam Sutton’s addition to the secondary will have officially marked at turning point for the Steelers at cornerback. Even if we admit that Steelers Nation is spoiled (we are) the fact is Steelers fans have had a rough 61 days. But yesterday the news out of the University of Pittsburgh Medical Center gave every Black and Gold bleeding Steelers fan something to smile about. The sight of Ryan Shazier standing alongside Ben Roethlisberger is a sight for sore eyes. It was just 61 days ago that we watched Ryan Shazier made a seemingly routine tackle against the Cincinnati Bengals only to roll over pointing at his back. Word was, even a few days afterward that Shazier would walk again. Yet, the inside linebacker has been in a wheelchair in every image relased since then. Until now. Shazier has some sort of brace on his leg, it looks like he’s holding onto something for balance with his right hand and his wheel chair, which he used to leave the hospital, is visible in the background. But Ryan Shazier is standing on his own and you have to stand before you can walk. Complain about Jesse James touchdown/non-touchdown vs the Patriots. Gripe about the spectacle of the Steelers cutting James Harrison, then watching James Harrison sign with the Patriots and help them get to the Super Bowl. Moan about Le’Veon Bell‘s contract talk and his tardiness. Whine about Pittsburgh’s piss poor performance against the Jaguars. Ridicule Randy Fichtner’s reverses to Antonio Brown in the Pro Bowl…. Steelers fans might think they’ve had to “endure” a lot, they might argue that taking Mike Tomlin to task without insisting that Art Rooney II fire him amounts to hollow criticism, but let’s be honest folks, no one in Steelers Nation has had a tougher stretch in these last 61 days than Ryan Shazier. And its not even close. Ryan Shazier standing next to Ben Roethlisberger signals he’s turned an important corner in his recovery. Perhaps it should also signal to both the franchise and fan base that its time to put a disappointing end to the 2017 season in the past and firmly focus on 2018. Everyone “Wishes Him Well.” But Is It Actually OK To Hope Ryan Shazier Plays Football Again? In the nearly two months since Steelers inside linebacker Ryan Shazier was lost for the rest of the 2017 season with a spinal injury in a Monday night game against the Cincinnati Bengals on December 4, the well-wishes and prayers for his recovery have been coming his way non-stop. That’s understandable and as hit should be. The spinal injury Tyan Shazier suffered didn’t just put him in a precarious spot from a football perspective, as so many spinal/neck injuries do, it left him paralyzed from the waist down, a condition that’s persisted to this day and one that, hopefully, is temporary. However, amid all the well-wishes and prayers for Ryan Shazier to soon leave his wheelchair behind, the one thing people are almost afraid to hope for is his ability to play football again. It was apparently even taboo for football experts, such as MMQB’s Peter King, perhaps the most prominent NFL writer around, to talk about the football ramifications of Ryan Shazier’s absence from the Steelers defense down the stretch of the 2017 campaign, as he seemed almost apologetic when discussing it during his local radio appearances or in one of his columns. Did Peter King need to be apologetic? Ryan Shazier meant a lot to the Steelers 2017 defense, so much so, in-fact, the chances of them finding another player who will possess his rare combination of speed and explosiveness seem pretty slim–at least in the immediate future. And that’s one of the reasons I’m rooting for Ryan Shazier to play football again for the Steelers and to do so at the highest level possible. “That’s selfish and insensitive!” you might shout at me rather self-righteously. Let me ask you this–and I don’t mean for this to sound flippant in any way–but if Ryan Shazier plays football for the Pittsburgh Steelers again, wouldn’t that pretty much take care of the walking part of the equation? I ask that rhetorically, because it obviously would. So what’s the big deal about wanting Ryan Shazier to play football again? Does that really make me seem selfish? Maybe it does, but selfish for good reasons. Why wouldn’t I want Ryan Shazier to recover to such an extent he’s an All-Pro caliber inside linebacker again? Wouldn’t that just be the greatest feel-good story in the history of sports?I can’t think of a better one, that’s for sure. 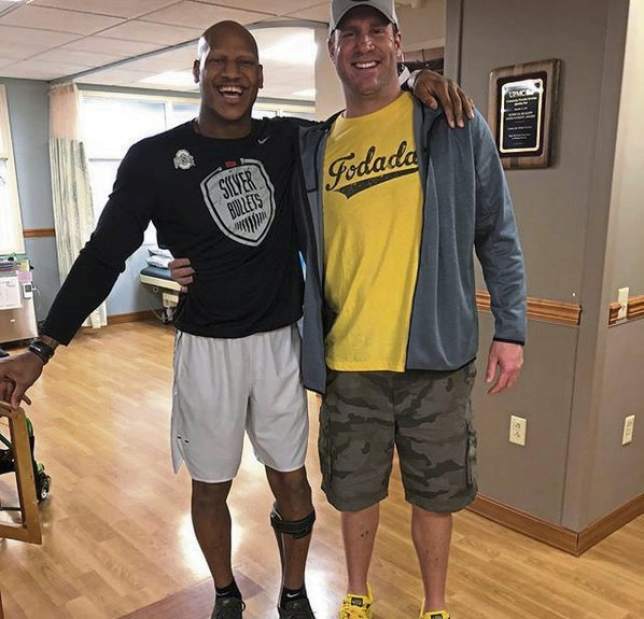 And while you’re busy feeling guilty or calling me selfish, you should probably know that Ryan Shazier, himself, is also dreaming of more than just being able to walk again. Think about it: We’re talking about a guy that spent most of his life playing a sport he loved with all of his heart and soul. Before games, it was common for Ryan Shazier to warm up shirtless–regardless of the temperature, which was often quite cold. If that wasn’t an indication of absolute passion, I don’t know what is. The way Ryan Shazier roamed from sideline to sideline with such zest and zeal on just about every play, you don’t do that if you’re not living your dream, your calling in life. At this point what’s the most likely scenario that sees Ryan Shazier setting foot on a football field again? Suiting up and running through the tunnel wearing number 50? Or coming out for some special tribute to his far-too short career with the Steelers? Sadly, that latter scenario is the one we’ll most likely see. But that doesn’t mean Ryan Shazier playing football again it’s not something worth hoping and praying for. Do I want this because it will make the Pittsburgh Steelers a better football team? Absolutely. 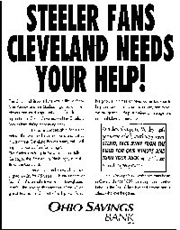 But I also want it for Ryan Shazier, because I know he’s hoping and praying for the same thing. Mea Culpa: Why I Changed My Mind on the JuJu Smith-Schuster Suspension to Support #FreeJuJu! Sometimes it’s simply best to fess up and admit you were wrong. So it is with me and the NFL’s decision to suspend JuJu Smith-Schuster. Let’s put it out front and center: I was wrong about JuJu Smith-Schuster’s suspension. Several factors influenced my change in thinking, which I expand below. In taking JuJu Smith-Schuster to task put his actions into the context of what we know today as opposed to yesteryearWhen I saw Greg Lloyd 3 count Al Toon after Thomas Everett knocked the Jets wide receiver out with a concussion during the 1989 Steelers shut out over the Jets I thought it was awesome. Of course at the time Mike Webster seemed to defying father time by playing for the Chiefs and the word “CTE” was close to 20 years away. No question Juju deserved 15 for taunting, but NO PLAYER IN NFL HISTORY HAS EVER BEEN SUSPENDED FOR TAUNTING. You throw the flag, give him 15, lighten his wallet and move on, damn it. There no arguing with that logic, and while the NFL mentioned the taunting in its letter to JuJu it apparently clarified that the suspension was for the hit, not the taunting. Even Jason Witlock and Colin Cowherd, two jouralists not exactly known for their support of the Steelers, went at pains to say that the hit only borderline illegal. Juju clocks Burfict and lays him flat. Burfuct [sic] at first springs up, and he tries to twist and grab Juju’s legs. Then the flags start flying and Burfict flops like some damned Serbian midfielder in a match against hated Croatia. Just like he falls to the ground game after game during other team’s offensive drives. Just like he said Antonio Brown did in the playoff game two years ago. (So it wasn’t something he hadn’t thought about) He laid there like a slug. And they strapped him to the gurney and took him to the field hospital where the Civil War surgeons were ready to amputate his leg or something. But, wait! According to media reports, the second he got into the tunnel and away from cameras, the SOB demanded to be unhooked, and he jumped up and started to head back onto the field. He was faking it! As no one disputes the press accounts that Burfict did in fact get off the cart after it was out of camera view, one must assume he did just that. And Homer’s analysis makes a lot more sense in that light. When the news broke that the NFL had suspended Juju Smith-Schuster and while also suspending George Ilokia for his hit on Antonio Brown, the league at least looked to be trying to keep up the appearance of objectivity. Never mind that Ilokia had a lot more opportunity to avoid hitting Brown’s head that JuJu had with Burfict. But of course Ilokia’s suspension didn’t stick as his lawyer got it reduced to a mere $36,000 fine. Sorry, no amount of sophistry can justify this, although Ilokia’s agent tried suggesting that Brown should have positioned his head differently. I suppose JuJu’s agent should have tried the same argument with respect to Burfict. 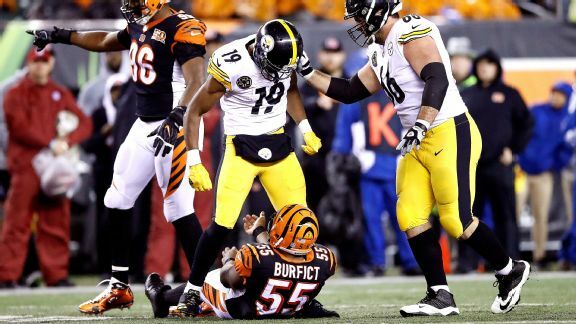 Except unlike Brown, Burfict didn’t have to worry concentrating to hold on to the ball as he was probably calculating whether he could injure Le’Veon Bell again. Tony Defeo has already written about the NFL’s hypocrisy here and taken the argument further by contrasting the 1 game suspension that JuJu Smith-Schuster got for unintentional yet a (borderline) illegal hit, where as Patriots pretty boy Rob Gronkowski clearly pre-meditated, almost pro-wrestling style elbow to the back of the head of Bills defenseless defensive back Tre’Davious White. Go read Tony’s full article, we need not rehash it here, but Defeo’s argument also played a role in shifting my thinking. Where’s the Suspension for Ahmad Brooks Hit on Antonio Brown?? And that brings us to the third factor that shifted my thinking. Where in the hell is the NFL’s suspension for the Green Bay Packers Ahmad Brooks illegal hit Antonio Brown? Gee, isn’t that interesting? Not only was Brown hitting hit from almost the same position that Burfict was standing in, unlike JuJu Smith-Schuster, Ahmad Brooks was clearly aiming at Antonio Brown’s head. 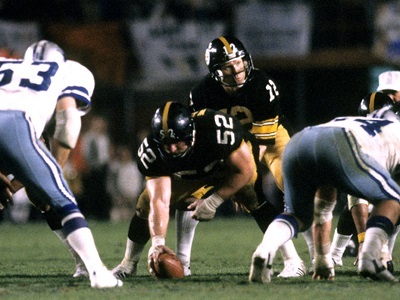 This play also came on a nationally televised game, and yet, the only discussion of it came thanks the discussion board on Jim Wexell’s Steel City Insider in response to observations made by Craig Wolfley. And just the point isn’t it? Cris Collinsworth and Al Michaels either missed this hit or chose not to talk about it. Jon Gruden got the rest of the NFL to look at JuJu Smith-Schuster’s hit, so Roger Goodell suspended him. No one saw Ahmad Brooks illegal hit on Brown, so it Goodell saw no reason to do anything. Iloka George didn’t taunt and Brown didn’t get taken out on a stretcher, so his suspension can be reduced to a fine. As for Ron Gronkowski? Well, he’s a Patriot and the one time Goodell tried to get tough on them he overcompensated, and it backfired. So Goodell’s back in his comfort zone of looking the other way when his buddy Bob Kraft is involved. Chronic traumatic encephalopathy aka “CTE” and related head trauma poses a threat to the existence of not just the NFL, but of football itself. Football will only survive if the risk of CTE is eliminated or greatly reduced. But arbitrary administration of justice, whether that be giving protection to Tom Brady and Peyton Manning but not Ben Roethlisberger, or trying to make James Harrison a scapegoat, simply erodes the integrity of the game, without touching the threat of CTE. And that’s why I’ve changed my mind. Apologies to readers for the error of my ways. #FreeJuJu!